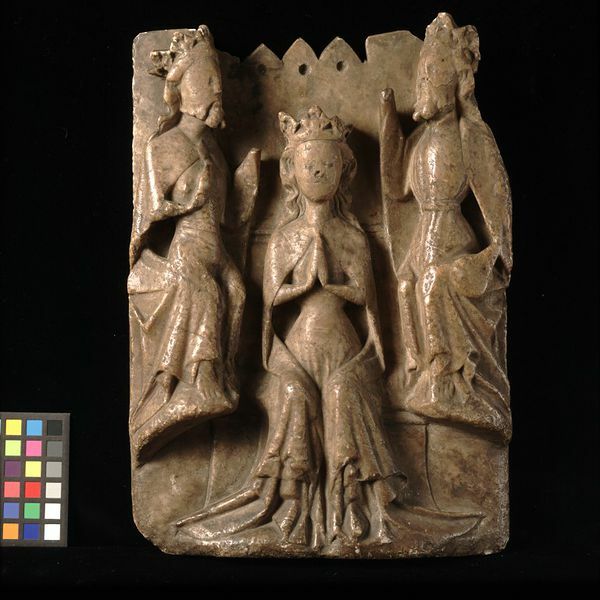 This alabaster panel representing The Coronation of the Virgin was probably made in the 15th century England. There was doubtless a representation of God the Holy Spirit either in the form of a third individual or as a Dove in the missing part of the panel above the head of the Virgin. Alabaster - a form of gypsum - is a comparatively soft material and is therefore easy to carve. It can also be polished. Its natural colour was especially useful for the representation of faces and flesh, which would normally remain unpainted. The crowned Virgin, wearing a close-fitting gown and a cloak fastened with a brooch, is enthroned in the centre of the panel, her hands held together. Above to the left, enthroned on a projection, is the crowned and bearded figure of God the Son, wearing a belt and a cloak fastened by a brooch. He turns towards the Virgin, his hands raised. A similar figure of God the Father is enthroned on the right of the panel, holding an orb in his left hand, right hand raised. Both are shown with bare feet; the Virgin wears shoes. There was doubtless a representation of God the Holy Spirit either in the form of a third individual or as a Dove in the missing part of the panel above the head of the Virgin. The top of the panel has been damaged and reshaped in a zigzag outline, with a hole under each point. The top right side of the panel is missing. The carving is badly weathered. The left hand of the Son and the right hand of the Father are missing. No paint remains of the panel. The back of the panel bears four holes, three plugged with lead with the remains of latten wire. Given by Alfred William Hearn in 1923.